This consists of a site visit to a property to determine the approximate location and extent of wetlands and/or streams (if present). A wetland sketch map is completed showing the general location and size of critical areas. This work does not include the actual flagging of wetland boundaries or collecting the necessary data for documentation. This type of work is best used for general planning purposes, project feasibility, or the buying/selling of property. This consists of a site visit to a property to determine the approximate location and extent of wetlands and/or habitat conservation areas, including streams (if present). Miller Environmental Services can map wetland boundaries using resource grade GIS to show the general location and size of critical areas. This work does not include the actual flagging of wetland boundaries or collecting the necessary data for a wetland delineation report. This type of work is best used for general planning purposes, project feasibility, or the buying and selling of property. A critical areas report includes the documentation of wetlands (wetland delineation) and/or habitat conservation areas (including streams or shorelines) located on a property or project site. This includes the location and documentation of wetland boundaries, stream boundaries (ordinary high water mark – OHWM), or other habitat conservation areas sufficient for project permitting needs. This includes the flagging of wetland boundaries and/or OHWM in the field and collection of data (soils, vegetation, and hydrology) following approved and current Federal and State methodologies. Miller Environmental Services can map critical area boundaries using a resource grade GPS unit and create maps in GIS. 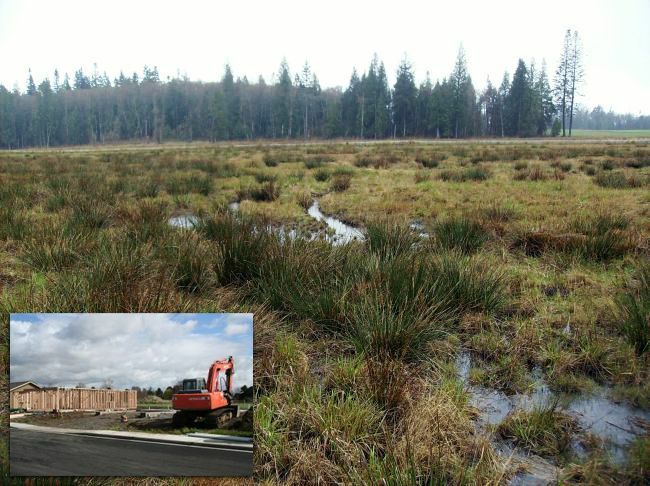 A Critical Areas Report is completed documenting these critical areas found on the property sufficient for permit submittal – including City/County, U.S. Army Corps of Engineers, and Washington State Department of Ecology. Ordinary high water mark determinations are required for projects near marine shorelines, lakes, and streams. Miller Environmental Services uses Washington State Department of Ecology guidelines to locate and mark the OHWM in the field. Required buffers are then measured from the OHWM. Miller Environmental Services staff are trained by Washington State Department of Ecology to conduct OWHM determinations. This includes assisting the applicant through the environmental permitting process with respect to wetlands, streams, habitat conservation areas, and endangered species. This includes working with the applicable agencies (including local, State and Federal) to move a project through the application phase to permit acquisition. This may include the completion and submittal of a Joint Aquatic Resource Permit Application (JARPA) for permits including U.S. Army Corps of Engineers 404 Nationwide or Individual permits, Washington State Department of Ecology 401 Water Quality Certification and/or Washington State Department of Fish and Wildlife Hydraulic Project Approvals (HPA). For projects with impacts to wetlands and/or streams, a mitigation plan is often necessary to complete the permitting process. This includes the completion of a report outlining the proposed project, proposed impacts, and appropriate mitigation to offset project impacts. Additionally, mitigation areas often require monitoring for several years after installation. Monitoring includes a site visit to assess conditions of the mitigation area and complete a report documenting the level of success and if necessary, recommendations for improvement. This includes the completion of reports necessary for FEMA floodplain Endangered Species Act compliance including the completion of a floodplain habitat assessment and determination of project effects to federally listed endangered species. This includes a site visit to document onsite conditions and completion of a report that may include project mitigation/conservation measures if needed.